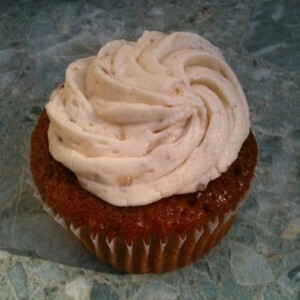 The cupcake which made me a fan of sweet potato-based desserts! On Saturday evening, I took my costume-clad puppy for her usual nightly walk around the neighborhood. We weren’t Trick-or-Treating, but I ended up going home with something delightful and sweet anyway– a free cupcake! Anyone who reads DCentric knows that I love food trucks, and I thought I knew all of the rolling players, from the purveyors of sought-after, coveted Lobster Rolls to the trucks that cruelly aren’t allowed in the city yet. But as we strolled down U street, I did a double-take at the big red van parked across from Ben’s. I had neither seen nor heard of Love Bites and as we walked up, the owner jumped out and asked if she could take a picture of my dressed-up pup. Flattered, I said, “Of course!” I was shocked when she handed me a free, “signature” cupcake, as a treat. “It’s sweet potato with cream-cheese frosting”. …and then I was surprised for the second time in five minutes. Long before I ran around and tried to sample every DC food truck’s fare, I was a cupcake-fiend whose Yelp take on Baked and Wired was once “Review of the Day”. I have a ridiculous sweet tooth, and I thought I had heard of every cupcake variation or flavor possible. “Sweet potato?” I asked, incredulously. I thanked her profusely and walked home. Later on when I tried it, I was amazed at how a root vegetable could become a delectable dessert. Don’t flame me– I’m brown and from California. Sweet Potato Pie is a Southern delicacy, not a San Francisco one. Besides, I haven’t told you the other interesting fact about Love Bites. It’s run by an African-American, Mother-Daughter team. I was so interested in learning more, I bugged them for an interview, which will hopefully happen in about an hour tomorrow morning*. Sweet potato cupcakes! From a food truck! Owned by women who are people of color! I can’t wait to talk to them. And eat another cupcake. Yum. *They had to reschedule, but never fear! DCentric is very flexible. And cupcake-motivated.